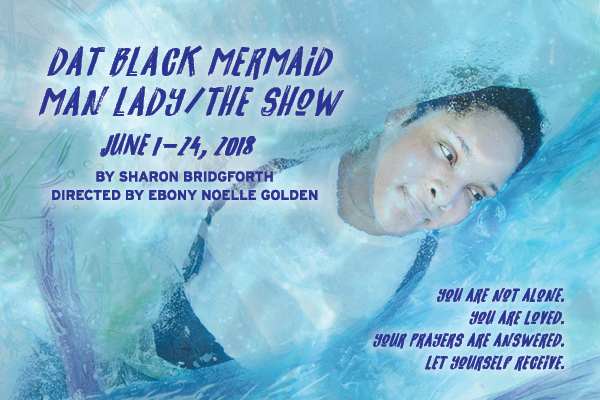 From June 1 – 24, Pillsbury House Theatre will produce the world premiere of dat Black Mermaid Man Lady / The Show, by Sharon Bridgforth, a performance processional celebrating the spirit of Black traditions. With dat Black Mermaid Man Lady / The Show, Bridgforth celebrates multiple ways of embodying gender and spirit, whisking the audience along on the journey to raise up a next generation healer. Join us for three weeks only as the cast, crew, and audience create collective magic. Please leave plenty of time to get to the theatre, as there will be no late seating for this production. the living, the dead and the unborn co-exist – pray forward next generation healers/Free. dat Black Mermaid Man Lady/The Show is a performance processional celebrating the spirit of Black traditions. The characters HoneyPot, Miss Kitty and dat Black Mermaid Man Lady work with Oya, Osun and Yemaya (Yoruba deities) to train in a next generation healer, as they lift communal prayers to the Light. In performance all present are invited to make offerings to this world of womanizing, piano playing, knife carrying she’roes and old people that fly. Performers sing, move, tell stories, call the audience to process, chant, holler back, build altars – celebrate life. All present are responsible for the Journey. dat Black Mermaid Man Lady / The Show is part of the dat Black Mermaid Man Lady / Home project. For more go to: http://datblackmermaidmanlady.com. dat Black Mermaid Man Lady/The Show was made possible by the Doris Duke Performing Artist Awards program, The Whitman Institute, Thousand Currents Artist In-Residence Program, development support from New Dramatists Creativity Fund (a program made possible by a generous grant from the Andrew W. Mellon Foundation) and is a project of Creative Capital. A child of the Great African-American Migration, Sharon was raised by Black Southerners who moved to Los Angeles/determined to make a better life for themselves and those to come. A Black queer child coming of age during assassinations, riots, the Black Power Movement and Soul Music – Sharon strives to model the unbending dignity, commitment to community, self-determination and Love of Black cultures that was modeled for her. Widely published, Sharon is Artist In-Residence at Thousand Currents (which funds grassroots groups led by women, youth, and Indigenous Peoples in the Global South). A Doris Duke Performing Artist, Sharon is recipient of funding from The Whitman Institute, Creative Capital, MAP Fund and the National Performance Network. One of the many artists mentored by Laurie Carlos, Sharon has worked in the Twin Cities regularly since 1995 and has proudly called Pillsbury House + Theatre home since 2005. The Great Divide Returns With 5 New Plays!